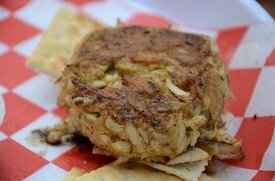 Do you know anyone who doesn't love crab cakes? Use these simple crab recipes for a brunch or lunch buffet. Serve with tempting mango salsa or zesty Remoulade sauce. Backfin and clawmeat are good for mini crab cakes because the size of the pieces are small. Use lump crabmeat for the full-size version. Add mayonnaise a little at a time until crab mixture just holds together but is not too moist. One hour ahead: Cook as directed. Drain on paper towels and let cool completely. Wrap each cake tightly in plastic wrap and refrigerate. Just before serving, unwrap and place on a baking sheet and reheat in a 400º oven for 5 minutes or less. One day ahead: Shape the crab mixture into cakes. Do not coat and do not cook. Store in a tightly covered container between sheets of wax paper. One month or less ahead: Freeze coated crab cakes, individually wrapped first in plastic wrap then in foil. Bake from frozen, increasing cooking time by about 3-5 minutes. The mango salsa and Rémoulade Sauce #1 will keep for several days tightly covered and refrigerated. Remoulade Sauce #2 will keep for up to 10 days refrigerated. Preheat oven to 400 F. Mix crab, onion, garlic, dry mustard, red pepper, Worcestershire sauce, lemon juice and mayonnaise. Add enough bread crumbs to bind, about 2-4 tablespoons. Add salt and pepper to taste. Using a teaspoon, shape mixture into about 20 walnut-sized balls. Spread remaining breadcrumbs onto a plate and roll balls lightly in crumbs to evenly coat. Slightly flatten and place on a greased baking sheet. Refrigerate until firm, about 30 minutes. Bake crab cakes until crisp and golden, about 10 minutes. Cool to warm or room temperature. In a medium bowl, combine the crab, 1/4 cup of the bread crumbs, the mayonnaise, mustard, Tabasco sauce, salt and pepper. Shape the mixture into 12-16 3/4-inch-thick cakes, about 1/4 cup each. In a large nonstick frying pan, heat about 1/2 inch of oil over moderate heat. When the oil is hot, add a few of the cakes and fry until golden brown and crisp, 2 to 3 minutes. Turn the cakes and fry them until golden brown on the other side, about 2 minutes longer. Drain on paper towels. Combine all the ingredients in a food processor with a metal blade and process for 30 seconds. Will keep for several days in an airtight container in the refrigerator.